Pasadena is home to plenty of celebrated buildings, from the Gamble House (aka Doc Brown's home in "Back to the Future") to its ornate City Hall (aka the Pawnee City Hall in "Parks and Rec"). Among these architectural gems, you don't hear much about Madeline Garden, a former furniture showroom with a fascinating semi- secret-ish history. Like a lot of the best things in Southern California, it blends the sacred and the profane. Situated in an expansive two-story brick building with courtyards, fountains and wrought iron details, Madeline Garden is located at 1030 E. Green Street — along with a phone repair store, a nail salon, offices and several apartments. For a couple years, it was Madeleine's Restaurant & Wine Bistro and before that Restaurant Halie, both helmed at one point by popular chef Claud Beltran. Halie's owners were the first to convert some of the space into an eatery, in 2001, making it colorful and minimalist with a red dining room and internationally-inspired American food, Beltran says. Madeleine's was a more traditional white tablecloth restaurant whose bar occupied what's now the main dining room. 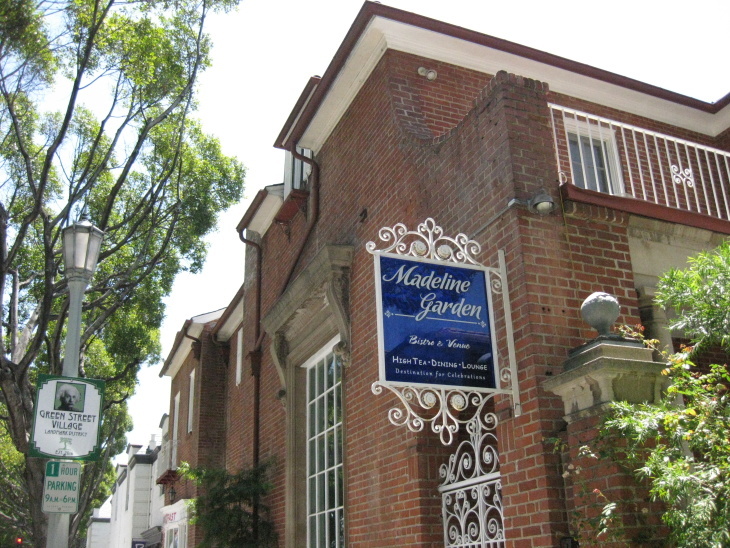 In 2013, the restaurant reopened under new owners as Madeline Garden with a couple blue-hued dining rooms, a funky wine bar and a back area for larger events. A small bistro and gift shop is currently under renovation. The latest menu features Italian and French-inspired tapas and entrees as well as a champagne brunch. High ceilings, an enormous fireplace with coats of arms on the mantel and lavish furnishings make the place feel like it was created specifically to host high tea, which it does daily. 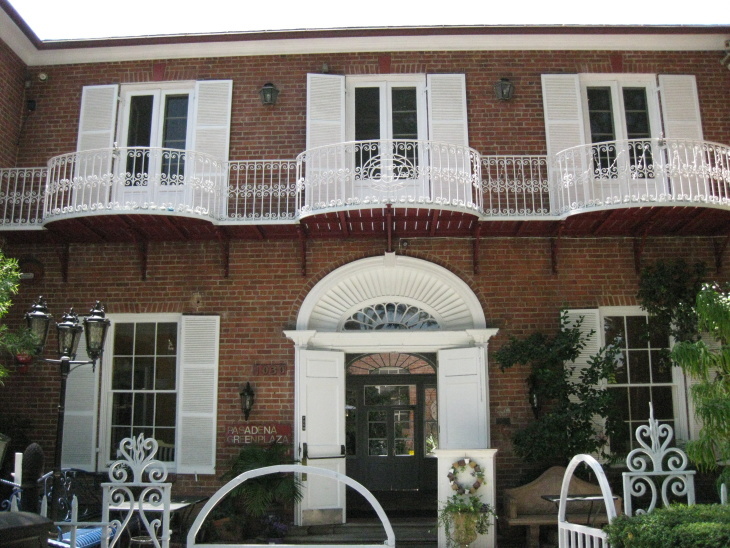 But the building actually dates back to the Jazz Age and it was designed with other purposes. In the 1920s, Edgar J. Cheesewright was Southern California's premier interior designer. Born in London, England, he came to Pasadena and, in 1918, set up shop with two employees. The firm grew to 118 people as Cheesewright designed yachts, hotels, country clubs and homes, including the famed Greystone Mansion in Beverly Hills. In 1929, he opened Cheesewright Studios, his expansive headquarters, on East Green Street, where Madeline Garden now stands. A plaque dates the building to 1927, which might've been when construction began or when it was designed. The 42-room, 35,000 square-foot Colonial-inspired structure was designed by architects Louis du Puget Millar and Edward A. Hayes. It housed Cheesewright's showrooms, design studio, furniture-making shops, storage room and offices. The gift shop sold Mexican glassware, imported art objects and other decorative items. Cheesewright wanted his business to look like a home — and not just any home. 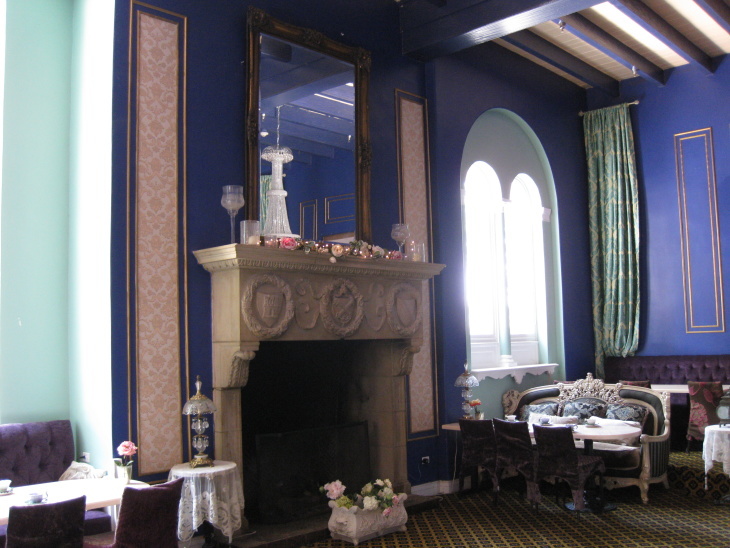 He stuffed the place with antiques and modeled the Italian fireplace in the main showroom (now Madeline Garden's main dining room) after one he had seen in Florence, Italy. 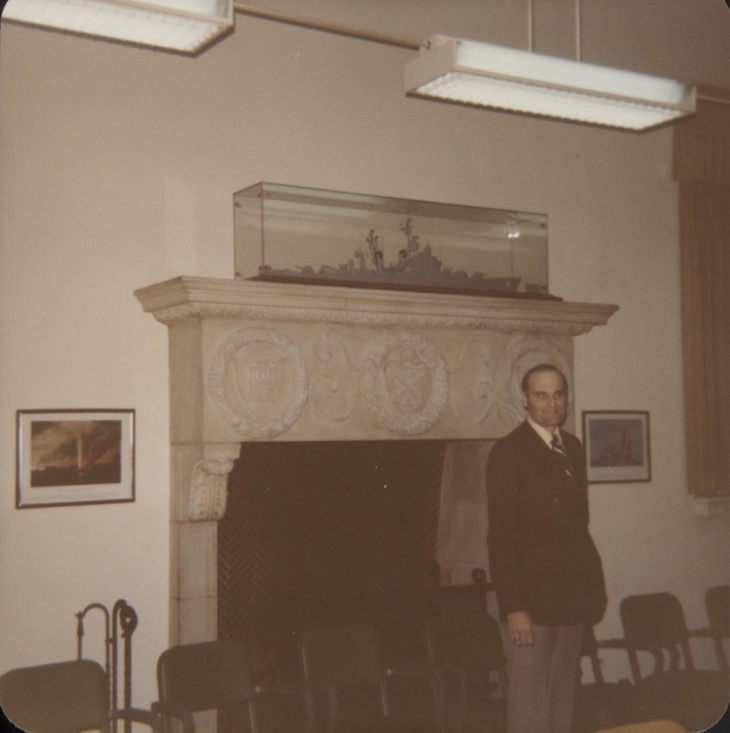 He installed a 150-year-old Georgian fireplace mantel from England in his office. 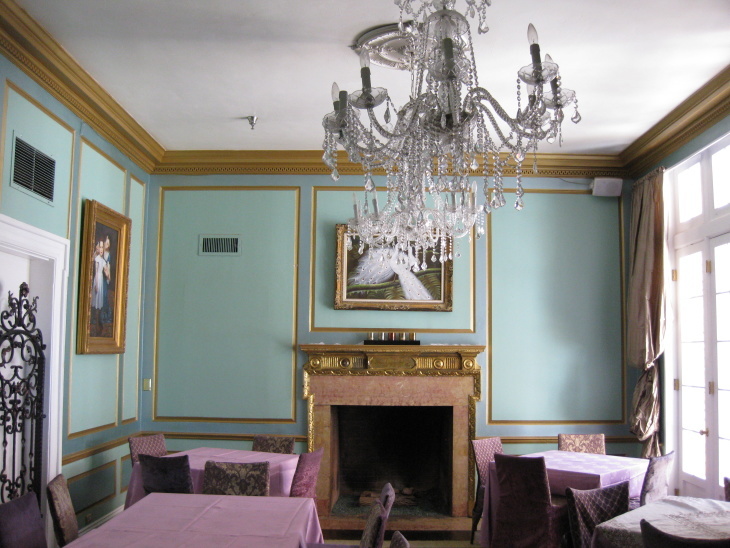 Originally paneled with knotty pine, the room now has Tiffany blue walls that made a perfect backdrop for "Mad Men." The mantel is still there, making it about 240 years old. Unless you're a tenant, you'll need permission to go upstairs, near the residences. 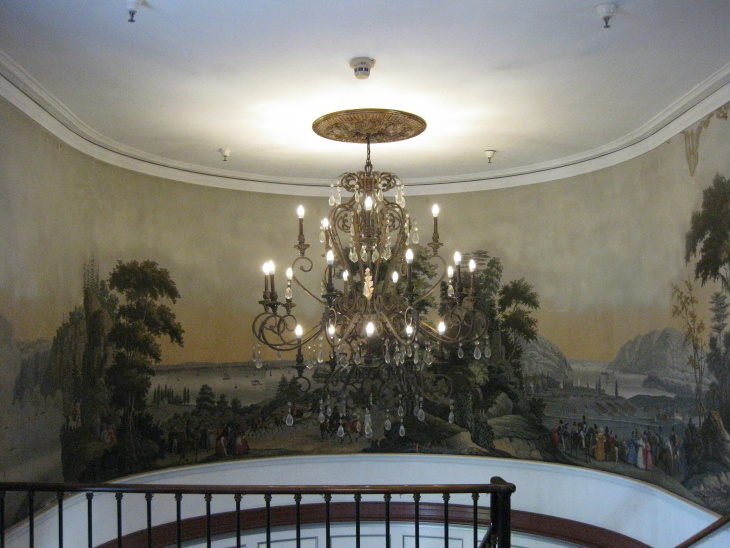 If you do make it up the spiral staircase, you'll see a circular foyer where Cheesewright installed a possibly antique Zuber block print mural of "The Views of North America" (also called "Scenes of North America"). A more vibrant version of the same Zuber print was installed in the White House when First Lady Jacqueline Kennedy redecorated the Diplomatic Reception Room. What's a Zuber print? Glad you asked. 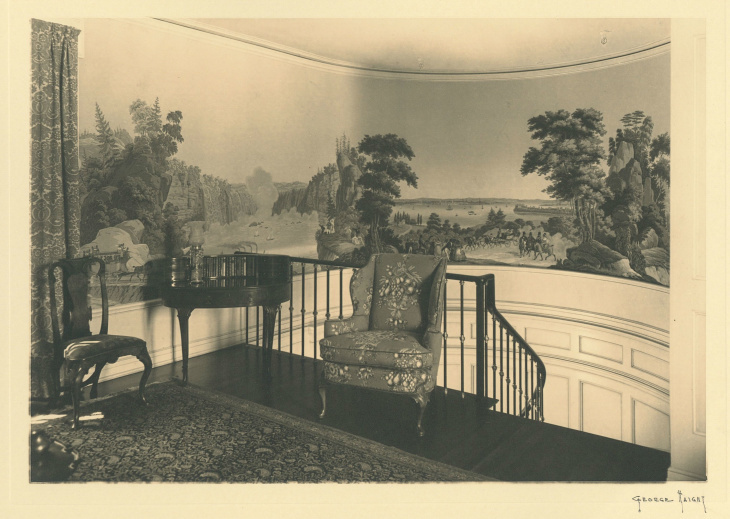 French company Zuber & Cie claims to be the world's last manufacturer of wallpaper made from woodblock-printed panoramic scenes. Zuber still uses antique woodblocks (imagine giant stamps) carved in 1834 to produce new editions of "Views of North America." Virginia "Ginny" Hoge, a Madeline Garden server, tour guide and building tenant has dedicated herself to researching the building's history. She thinks the Zuber mural in the old Cheesewright building may be one of only two full sets in the United States. It dates to at least 1929, when Cheesewright installed it, but it could have been created in the 1800s. At one point, landlord Shine Qu attempted to restore the mural, which had suffered water damage, but halted the process when he realized it wasn't being done properly. 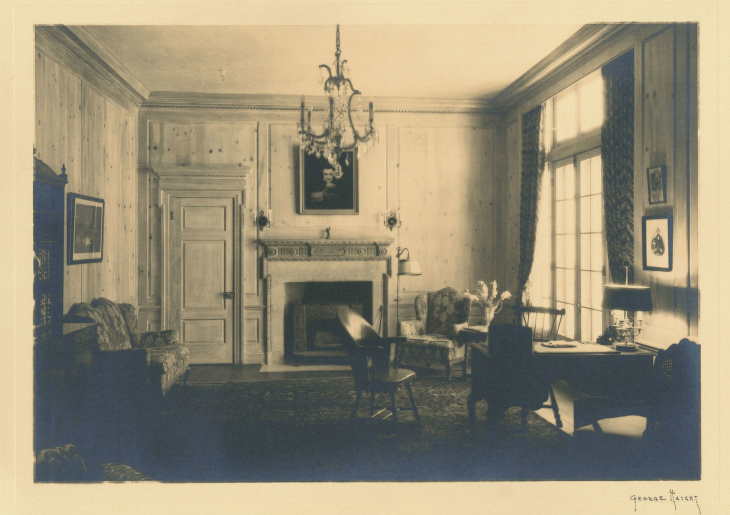 Cheesewright's studios remained at the site until 1936, when architect Louis du Puget Millar moved into the building. In 1943, Cheesewright leased the space to CalTech and scientists used it to conduct research into nuclear fission. A few years later, in 1946, the plaza became the Navy Undersea Research and Development Center, which included a much larger property about three miles away, on Foothill Blvd. 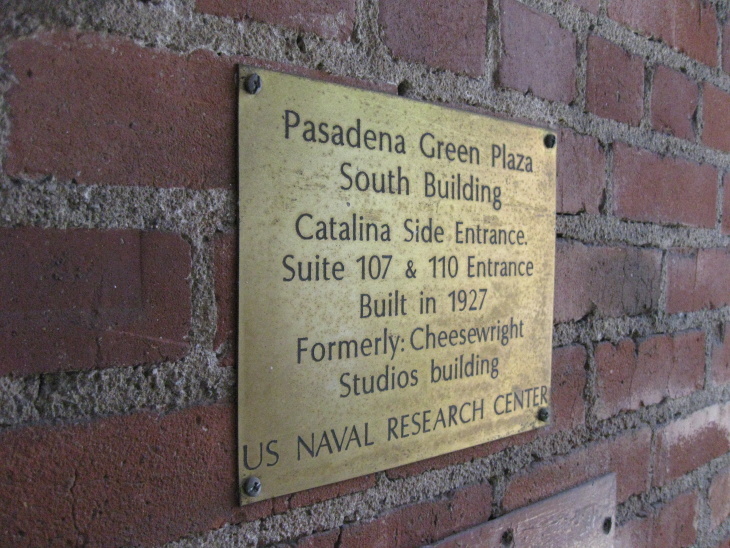 The Cheesewright building housed the department's administrative and managing staff while the Foothill Plant tested classified materials and torpedoes. Developers are eyeing the Foothill property but there are concerns over toxins left by the military. An old Pasadena Star-News blurb claims the military developed part of the atomic bomb at the former Cheesewright site. 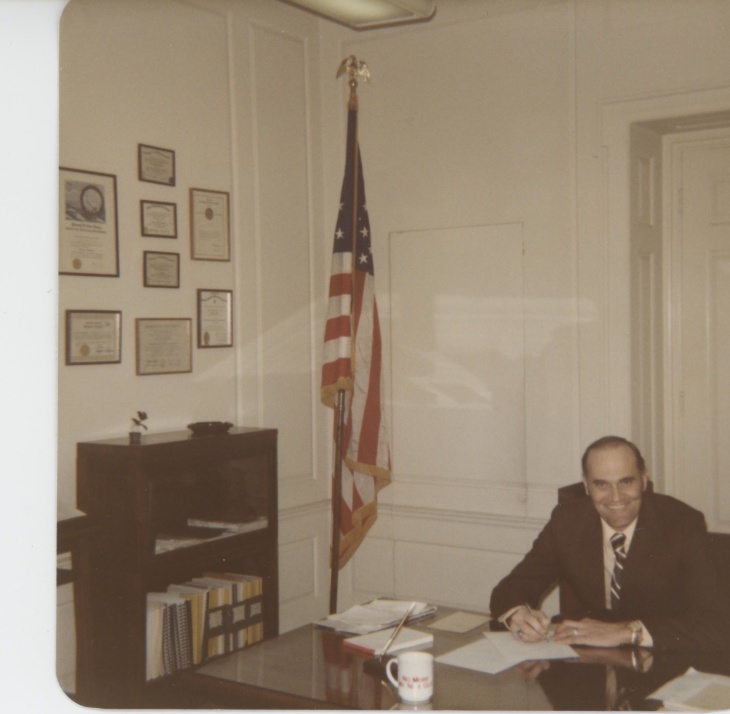 "I was told by a few of the scientists who worked for me and had been there several years before me that the trigger mechanism for one of the bombs or devices was fabricated in the garage of the facility," says Dennis Laack, commanding officer at the Office of Naval Research Regional Office in the building from Nov. 1979 to Jan. 1982. During that time, Laack worked out of Cheesewright's old office. The main design showroom became a naval conference room. He supervised a staff of about 60 people tasked with managing research being done by universities in the western U.S. Rumor has it that Albert Einstein once had a laboratory in the basement. And that the basement had tunnels leading to Caltech. And that Einstein used them while working on the Manhattan Project (aka the atomic bomb). 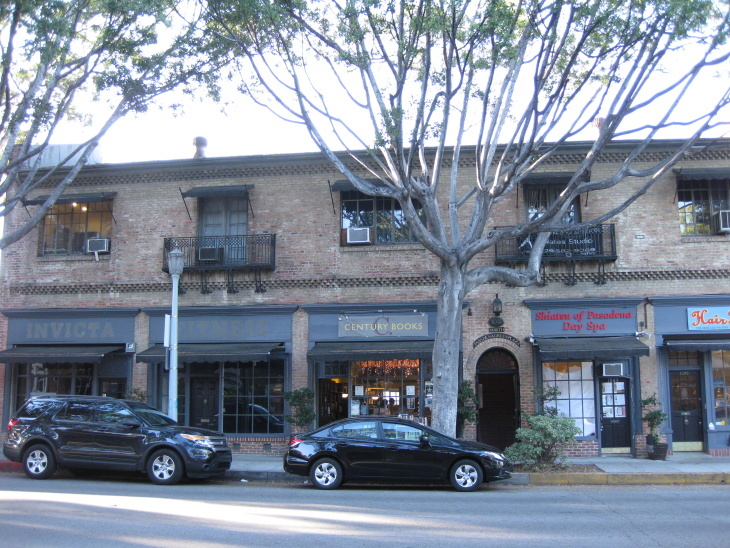 Pasadena Green Plaza North, which is right across the street from Madeline Garden, also claims an Einstein connection. (The two buildings are owned by the same company.) They believe the scientist kept an office there in 1936. A poster on the second floor proclaims as much and a real estate listing refers to it as the "Einstein building" and says he occupied suite 201. Fact or fiction? Einstein worked in Pasadena as a visiting professor at Caltech during three well-documented winter terms in 1931, 1932 and 1933. He spoke at the dedication of the astronomy building at Pasadena Junior College (now Pasadena City College), gave a national radio address at the Pasadena Civic Auditorium and was photographed by the Los Angeles Times at Caltech with Dr. Richard C. Tolman, a chief advisor on the Manhattan Project. As for a secret lab and office on Green Street? There's no concrete proof of his connection to either building. "Albert Einstein never spent time in the building on Green Street and was never in California after March 1933 and therefore never did any war research there, let alone anything connected to the Manhattan Project," according to Diana K. Buchwald, professor of history at Caltech and director of the Einstein Papers Project. "We have told the owners of that building for many years, it was Albert Einstein's son, Hans Albert Einstein, who worked briefly for the Office of Naval Research in the 1940s in Pasadena." A Pasadena Museum of History archives volunteer found no records — no address registries or anything else — relating to Albert Einstein and an office on Green St.
Einstein maintained that his only role in America's atomic bomb was an indirect one — a letter he wrote to President Franklin Roosevelt in 1939 urging the U.S. to research atomic weapons before Germany used the deadly technology, according to the American Museum of Natural History. That hasn't stopped Pasadena's Green Street Village Landmark District, which includes the former Cheesewright building, from posting street signs with Einstein's face. Accounts also differ about the alleged tunnels under the Cheesewright building, which were supposedly used by the military and/or Manhattan Project workers. "We did research the tunnel question a number of years ago when we had an event at the restaurant and debunked the tunnel story," says Sue Mossman, with preservation group Pasadena Heritage. "There may have been a tunnel under Green Street for utilities, etc. connecting to some building(s) on the north side of the street which had some related use, as I recall, but not to Caltech. There are lots of tunnels at Caltech itself, and kids used to play Dungeons and Dragons in them, and I'm sure other student stuff, but not running all the way to Cheesewright." Hoge remains a believer. She thinks the lack of documentation on Einstein or the tunnels is part of a government conspiracy to stay mum on the property's connection to the Manhattan Project. Pasadena native and paralegal Dylan Littlefield helped Hoge look into the history of the Cheesewright building. He says that when he made a public records request through Naval Air Weapons Station China Lake, "Literally everything about that address came back as 'unable to disclose that information.'" He also says that more than 20 years ago, when the Cheesewright building was vacant, he took an informal tour of the basement. He recalls his "tour guide" showing him a recessed wall covered with a door and padlocks that was supposedly a tunnel entrance. Former Navy commanding officer Laack is skeptical. "I didn't hear about or know that such tunnels existed," he says. "The basement had several machines — lathes, saws, metal bending machines, etc. — which, I assume, remained from work that was done previously." These days, the basement is a dusty maze of storage rooms. Several temporary walls have been erected and it holds what looks like an old incinerator. Under the stairs, where the tunnel entrances supposedly were, we noticed a large piece of wall covering what seemed to be a hollow space. Could some of those walls be covering tunnel entrances? We didn't have a jackhammer to test the theory. It's hard to find information about Cheesewright's later years. Near the end of his life, he consulted on several important projects and was honored as a Fellow by the American Institute of Decorators. After a storied career, Cheesewright passed away at his Pasadena home in 1957 at the age of 77. 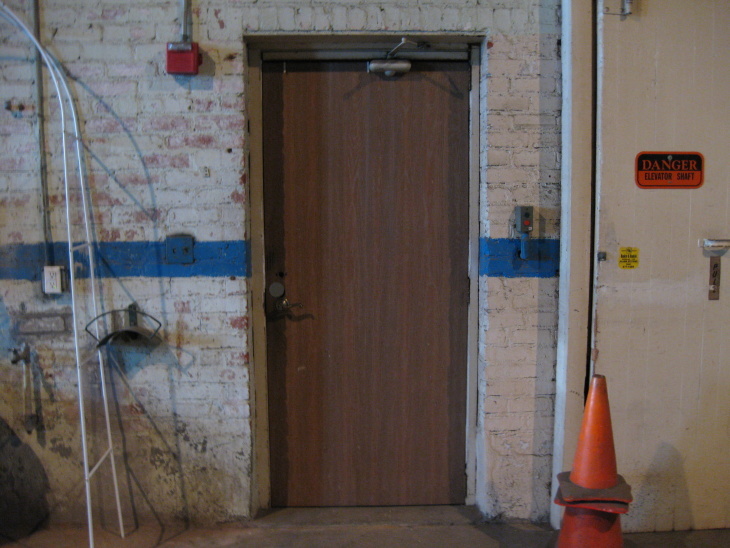 In 1987, the Cheesewright Studios building suffered structural damage in the Whittier earthquake and the military vacated the space. Three years later, the government auctioned off the former Cheesewright building for $485,000. What was once an atomic bomb research site eventually became a restaurant that hosts bridal showers and wedding receptions. In a 1938 article in "California Arts & Architecture," Cheesewright opined that modern architecture and design would never replace traditional. A quick trip to IKEA would undercut that claim. But at Madeline Garden, an oasis of old world architecture peppered with relics and decorative flourishes, it's not hard to believe. You made it! Congrats, you read the entire story, you gorgeous human. This story was made possible by generous people like you. Independent, local journalism costs $$$$$. And now that LAist is part of KPCC, we rely on that support. So if you aren't already, be one of us! Help us help you live your best life in Southern California. Donate now.